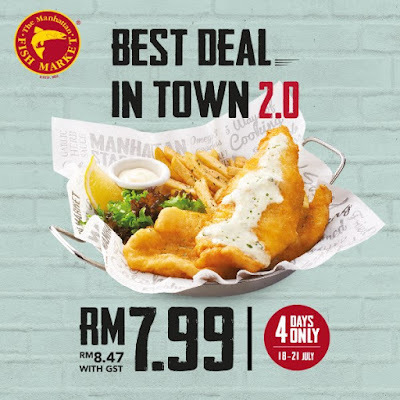 The Manhattan FISH MARKET RM7.99 Best Deal in Town is back! For only 4 days, 18 - 21 July 2017, enjoy your favorite Manhattan Fish 'N Chips from only RM7.99 (RM8.47 with GST). There are 3 sea-lections of fish (Dory, Cherry Snapper & Salmon) to choose from, with a newly added option: the nutritious Salmon Belly. Enjoy your meal in Fried or Grilled and complete your meal with 4 add-on choices. Please LIKE, SHARE & tag your friends & family ya!